Assembly Republicans moved closer Wednesday to passing legislation that would make stripping public schools of race-based nicknames and mascots more difficult, pushing the proposal through committee and setting up a floor vote next week. Republicans introduced the bill to help the Mukwonago Area School District, which has refused a state Department of Public Instruction order to drop its "Indians" nickname. The Assembly's government operations committee passed the proposal on a 7-4 party-line vote despite minority Democrats' complaints that the measure represents a step backward in race relations. "I can't imagine high school students sitting at their high school football game and having thousands of people around them yelling stuff like 'slaughter the Indians' or 'slaughter the Apaches,'" Rep. Christine Sinicki, D-Milwaukee, said. "That to me is completely wrong. It breaks my heart to see we're going back down this road." The bill's supporters countered that current state law is too slanted toward complainants and doesn't give schools a fair chance to defend beloved nicknames they've used for decades. "Only one person can file a complaint and the bureaucrats take over," said Rep. Stephen Nass, R-Whitewater, a committee member and the bill's chief sponsor. "The person doesn't even have to show one instance where he or she was offended." 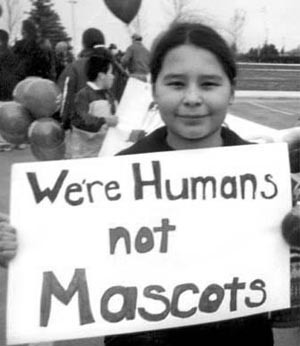 Under current state law, a single person can file a complaint about a nickname or mascot. School district officials then must prove the moniker doesn't promote discrimination or stereotyping at a Department of Public Instruction hearing. DPI makes the final decision on whether the district can keep the nickname or mascot. The bill would require anyone seeking to force a change to collect petition signatures from district residents equal to 10 percent of the number of district students. The complainant would then have to prove discrimination to the state Department of Administration. That agency, not DPI, would make the final call on whether the name or mascot must go. The measure also would erase all existing DPI orders to school districts to drop race-based names. Barbara Munson, an Oneida Indian who chairs the Wisconsin Indian Education Association's Indian Mascot and Logo Task Force, has labeled the measure racist. Committee debate was brief but heated Wednesday. Rep. Fred Kessler, D-Milwaukee, warned Republicans that the United States is no longer the predominantly white country of sixty years ago. He questioned how the bill would help the GOP build inroads with minorities heading into the next election cycle. "I don't understand how you sanction this boorishness and expect you're going to receive the blessing and support of people of diverse races in this country," he said. Sinicki said she understands schools' attachment to their nicknames and mascots, but they're fictional characters. Rep. Brett Hulsey, D-Madison, said he's of American Indian descent and called the bill racist. "White people don't get it. You don't care. You're sticking a finger in (American Indians') eye and you don't have to," he said. Committee approval means the bill is now available for a vote in the full Assembly. Republican leaders in that chamber have tentatively scheduled that vote for Tuesday. The Senate's government operations committee held a public hearing on the bill Wednesday afternoon. Mukwonago Superintendent Shawn McNulty called the current law allows one person to trigger a process that schools can't win. "Guilty until proven innocent. That's a concept that hasn't been used in our country since the Salem witch trials," McNulty told the panel. Ho-Chunk Nation President Jon Greendeer told the committee his remarks will change nothing because the GOP has clearly decided to pass the bill. Still, he said no one consulted his tribe about the proposal. He also equated the 10 percent signature requirement to forcing a person who feels he or she has been sexually harassed to get 10 percent of his or her co-workers to agree before filing a complaint.